1842 (Apr. 7) Baltimore, Md. 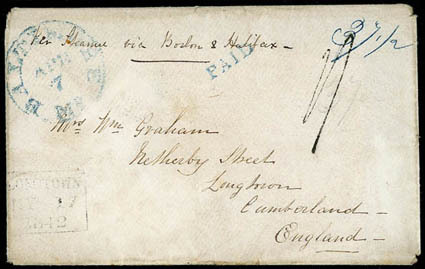 to Longtown, England, envelope with letter with blue "Baltimore, Md. Apr. 7" cds with matching "Paid" handstamp with blue manuscript "37½" rating for double-weight to Boston, carried by Cunard Line Britannia from Boston May 1st to Liverpool arriving May 15th, black "1/-" shilling due rating, Longtown (5.17) framed arrival datestamp, Very Fine, a scarce example of a pre-1845 envelope on transatlantic mail, ex-Winter. In the U.S., letters were charged by the number of sheets of paper until the shift to a weight basis in July 1845. Because envelopes were charged as a sheet of paper, they were seldom used in this country before July 1845. A link back to Sale 75 - Lot 196, along with its description, will be appended to your message.